How do I use the Restrictive Shipping module? 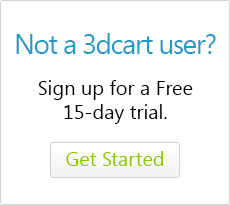 3dcart’s Restrictive Shipping add-on allows you to restrict individual products to use specific shipping methods when they are purchased. For example, if your store sells a mixture of perishable and non-perishable items, you may need to restrict your perishable items to use an overnight shipping method whenever it is present on the order. This way, regardless of whether your customer purchases a perishable item on its own or in conjunction with non-perishable items, the restricted shipping method will always apply to the order. Once there, click on "Edit Settings" under "Shipping Settings"
Within this section, you'll see a series of checkboxes. Locate the checkbox labeled "Enable Shipping Restriction Per Product" and make sure it is marked. Once the add-on is enabled, you can begin the process of editing your products to use their applicable shipping methods. You will now see a small window pop up on your browser which will show a two-pane window. On the left pane will be your store’s current shipping methods. From here, you can select shipping methods from the left pane and move them to the right pane by clicking the designated arrows. The restrictive shipping module does not differentiate between multiple shipping methods of the same type. In other words, let's say you have one shipping method (i.e. UPS ground) which is reserved for wholesale customers, and a second shipping method (also UPS ground) which is reserved for retail customers. When assigning the restrictions in the screen above, both methods will be moved into the "Selected Shipping Methods" pane. To remove a shipping method from the product’s restriction, select the shipping method on the right-hand pane and click the left pointing arrow. After selecting your methods, click on the “Close” button and save your product. Your product will now be restricted to only use the methods restricted to it. This means that – as long as the product is in the order’s shopping cart at the time of purchase – the only shipping methods that will apply to the order will be the ones restricted to the product. When restricting various shipping methods to various products, it important to understand how the cart will display the restricted shipping methods during specific situations. Is not restricted and can be shipped using any shipping method. The cart will only offer the Priority shipping method during checkout since that's the shipping method restricted to the product. The cart will only offer the Next Day shipping method during checkout since that's the shipping method restricted to the product. However, if both Product A and Product B are on the order, the software will not be able to favor one method over the other and will display them both. It is then up to the shopper to select the method that they prefer for the order.